With Online Banking you can manage all your accounts from one easy screen. 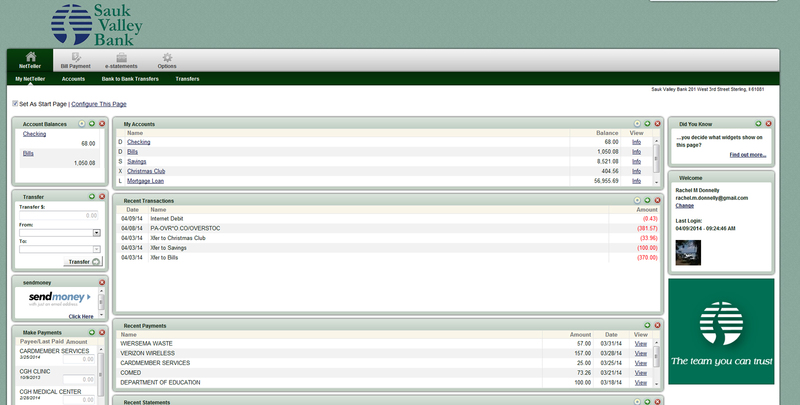 View your accounts, recent transactions, account balances and make transfers all from one screen. Pay bills, transfer between accounts all from your homepage. Configure your homepage the way you want it to look! Online Banking is made simple, easy to use and most of all – convenient. Download transactions into money management software such as Quicken or Microsoft Money. Spreadsheet and Text formats are also available. Interested in signing up for Online Banking? To enroll in Online Banking, click here and provide some basic information securely, confidentially. A customer service representative will be able to get you going. We will contact you via e-mail once you are set up.